The Class C Motorhome: How To Achieve The Maximum RV Lifestyle! For those of you who have been loyal readers to our Class C Motorhome site, you may notice some subtle and not so subtle changes in the coming weeks. Our original goals for this site was conceived and designed with one purpose... to discuss the small (less than 30') motorhome. This was an obvious choice for us because we owned a 24' motorhome, and we wanted to share our personal experiences. However, our beloved ole' Tioga was starting to show its age. This Class C Motorhome was purchased in 2005. Sooo, we decided to get a "newer, more modern vehicle". When we came across a little 26' Class-A-Motorhome, it got my attention. Essentially, a Class-A-Motorhome this small is sort of kinda like a Class C Motorhome with a better turning radious and improved GVWR (Gross Vehicle Weight Rating). Also, the thought occurred to us that a lot of people have made a large investment in their various recreational vehicles (RVs) and they may also have questions about these rigs. Therefore, as we gained more experience and understanding about motorhomes, we decided to expand the topic of the site to include some Class A Motorhomes that are under 30' in length. Bottom line we are expanding our focus of the website. We hope to continue our web site here, and create a new site showcasing the smaller, "less than 30' Class C Motorhome and selected Class A Motorhomes". We feel that it just makes sense because the RV Market has exploded in the last 5 years or so with many different models to choose from. Let me slow down here and give you a little background on who we are. My name is Jim, and I retired out of the Department of Defense in the year 2000 due to base closure. I was an engineering technician working at McClellan AFB, and way back when, the Sacramento Army Depot. My job was, simply put, to do whatever needed to be done. It encompassed a broad spectrum of activities ranging from writing technical procedures, reverse engineering repair processes, and writing/verifying MIL-STDs (Military Standards) for various defense applications and test equipment. We are not full-timers due to the fact that we have new grandchildren popping up and we like to stay close. My wife Lynn, has recently retired from a local school district as a speech pathologist. She is the person that keeps me on track. Without her, I would probably go off on some weird tangent... Lynn does a lot of editing and also acts as the watchdog looking out for your best interests. This site focuses on some technical/repair issues, accessories, and travel destinations dealing with RV's in general and Motorhomes in particular. We will write about stuff that we are doing, or thinking about, as our motorhome experience matures. We are doing a lot of exploring in Northern California and select parts of this wonderful country. As we write about these experiences and locations, we will pay special attention to areas that are suitable for RVs 30' and less. We have been accomplished camping, biking, and boating enthusiasts for most of our lives. During the last few years We've added motorhomes to the list. This motorhome ownership thing has been quite an eye opener. We are having a lot of fun, but it has been a reality check. When we bought our first motorhome; I did not have a clue. However, that has never stopped me before. Actually it isn't as bad as it sounds... these rigs have given me an opportunity to learn many valuable lessons. It has been a good school, and I want share my lessons with you. The Class C Blog keeps you up-to-date with all additions and changes to the class-c-motorhome-info-made-simple.com web site. Subscribe here. Search Queries are the magic that make the Internet work! Simply type in your search queries, if I have written about it, you will find it here! Site Map: Index grouped by subject. Your motorhome chassis will get you there and back... how important is it to choose the right system? Aftermarket Class C Motorhome Accessories Can Improve Your Rig's Performance! Class C Motorhomes And Housekeeping: Can We Make It Simple? You're in your Class C Motorhome and you know some housekeeping will be in order once you arrive. RV Accessories are the Magic that Brings out the Best in your Class C Motorhome! RV accessories can help you create a class c motorhome that will better suit your needs. RV Repair: It Seems Like Something Always Needs Attention. RV Repair: Sooner or later, something is going to need fixing! Dinghy towing is a good option... if you want to save dollars on the high price of fuel! Branson, MO: A Great Destination With Something For Everyone! Branson, MO is the place to go if you like live shows, golfing, fishing, or just relaxing by the pool! California Attractions: So Now That We Are Here, What Are We Going To Do? California attractions have been drawing people here for decades... why would the Class C Motorhome owner be any different? So, what makes this state so popular? 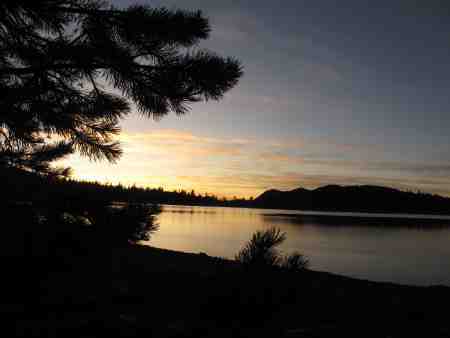 California Camping Opportunities Are As Diverse As Its People. California camping: Over 800 miles of coastline, several mountain ranges, and two major metropolitan areas... you cannot find a more diverse location in the U. S.
Taking these small California hiking trails that are less than 10 mile long, will let you see another side of California. 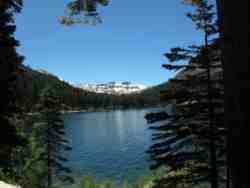 With over 5,000 California Lakes to choose from, you gotta' find some place that your will like! Mobile Communication: How To Stay In Touch With Friends And Family! Mobile communication choices: Just how important are they? Our Santa Cruz Boardwalk still has the tastes and smells that captured the hearts and minds of millions throughout the last century. This park is over 100 years old... and is still going strong! A Great Destination Travel... Do YOU Have Story or Experience? An American River rafting trip on the North, South, and Middle Forks of the upper American River will satisfy everyone’s rafting needs. 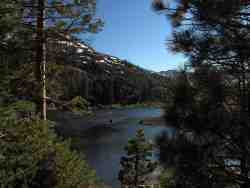 Mt San Jacinto State Park Is mostly a designated wilderness area. With access to Palms Springs Via the Aerial Tram! The La Brea Tar Pits Is a Time Capsule Going Back 40,000 Years! The La Brea Tar Pits are clustered throughout Hancock Park in the urban heart of Los Angeles, next to the Miracle Mile's Financial District. California beaches offers great sunsets, and open areas that go for miles. There are also numerous scenic pocket beaches with bluffs that have stunning views of the Pacific Ocean. Our Southern California Beaches Allow You To Simply Walk In The Warm Sand, Sharpen Your Surfing Skills, Build Sand Castles, Explore Tidal Pools, Or Simply Lay In The Sun! The San Joaquin Delta Is A Prime Class C Motorhome Destination! The San Joaquin Delta has a slower paced way of life that is not typical of California's high energy, get it done now lifestyle! The Cosumnes River is the last free flowing river cascading out of the Western Sierra Nevada Mountains… it has never been dammed! The Sutter Buttes are vulcanic lava domes that are located in what was once the center of the Maidu indian territory. California's Waterfalls Have A Magical Attraction! Califronia waterfalls attract people to remote locations througout the state. Branson Golf: This town will give you at least 12 courses to choose from... everything from pitch & putt to an award winning 18 hole course. An RV Air mattress: Do you want to just lay on top of it , or enjoy optimum universal support? An RV foam mattress: Why do they work as well as they do? The innerspring mattress has been around for over 100 years...is it still a viable choice for sleeping solutions? Motorhome Mattress Shopping: Where Do You Start? When you are motorhome mattress shopping, how do you know what types are suitable for your Class C Motorhome? Reese Hitches: Can They Save Us Dollars When It's Time To Pull Stuff? Battery Care: How Do You Take Care Of Your Deep Cycle Batteries? Battery Care: How to conserve and care for your deep cycle battery. Your Deep Cycle Battery will let you leave the grid behind and enjoy nature at its best! Does it make sense to always run the factory installed RV propane heater? What are your other options? RV Solar Panels & Batteries are the cornerstone to a well-balanced power system that will bring freedom to you and your motorhome. An RV Wind Generator Will Let You Capture The Power That Is Blowing Past You! We all like free stuff, why not harness the wind with An RV Wind Generator! Here Are Some Cleaning Tips That Will Make It Easier To Keep Our Class C Motorhome Sparkling Clean! RV Bedding Options, The Old Against The New... Sometimes It's Mix & Match! RV bedding can be put off and ignored, or it could help you obtain more rest and relaxation. Kitchen Cleaning: Why Make It Hard, If You Can Simplify The Task? Kitchen Cleaning: Not high on the list of things we want to do. However, the kitchen is one of the first things we see when entering a Class C.
Does a hand crank laundry machine, or a powered one make life on the road easier. Are they really necessary, will a roll of quarters work as well? A Washer Dryer Combo: Could This Be A Benefit In Your Class C Motorhome? Would A Class C Motorhome Washer Dryer Combo Make Traveling Easier? Computer Cleaning Is Something That Should Be Performed On A Regular Basis. Computer Cleaning requirements are similar to housekeeping requirements… you don’t wait until they are trashed to clean them. How to Buy RV peace of mind: This is not what we think about when we go looking for a new rig. Should this be part of the process? RV safety: When you are on the road, stuff happens. Are you safer in a class A or class C motorhome? It's not the RV tires we ride on... it's the pocket of air inside. It holds us up and gets us down the road. The Chevy Kodiak: A real workhorse for the serious Class C Motorhome owner that wants to bring it, haul it, or pull it. The Dodge Sprinter will get you down the highway in a quite safe vehicle that gets good mileage too! The 2008 Ford E 450 has its first major upgrade in 28 years... what did they do? Chevy and the Workhorse Chassis is determined to be competitive in the Class C Motorhome arena with a 5 year 50,000 warranty, and a Free 24/7 emergency roadside assistance program! Dry Rot: What Is It, And How Can It Harm Our Class C Motorhomes? Sooner or later we are going to find some dry rot somewhere on our Class C Motorhome. What can we do to control it? What do you do when your rubber roof needs attention? Is it easy to fix? Rubber roof repair: Knowing how to repair your rubber roof may save your Class C Motorhome from unwanted water intrusion. Water Damage: Two words that an RV enthusiast never wants to hear! Class C Water Damage Repair Part II: Sooner or later, something is going to need fixing! While on the road, do you find coverage uneven and erratic? You may need a cell phone amplifier. Will your mobile Internet connection allow you to have decent Internet access? Mobile Broadband gives the Class C Motorhome enthusiast wireless connectivity and convenience. Different battery types are used in our handheld mobile devices. They all need to be maintained. What is the proper methods to keep them healthy? Some RVing Tips on why you want to winterize your Class C, change your engine oil, inspect the tires, and do some preventitive maintinance. Changing Oil: This Is Something We All Have To Do... What Are The Options Available For Maximum Engine Protection? Enhanced Oil Filtration Keeps Your Engine Running Clean! Enhanced oil filtration will allow you to achieve longer drain intervals and better engine protection for you class c motorhome! Engine Oil: What is the mystery behind it? Who determines what standards are set, and how are they enforced? What is a Phantom Loads: How do you know if you have one? Fuel economy is something that everyone is concerned about in todays Class C Motorhome lifestyle. What Is GVWR? Why Does It Matter To You? What is GVWR and the carrying capacity chart ? How does this relate to you? Gross Vehicle Weight Rating: How to get your motorhome weight under control for your chosen lifestyle. Recreational Performance...you and I purchased a motorhome for a reason. Are we able to go and do what we want, when we want? How Does Energy Conservation Enhance Your Motorhome Lifestyle? Would energy conservation keep you off the grid longer, and does it matter? How can I guard against faulty shore power and safeguard my electronics when traveling? Motorhome Storage : Just How Much Can We Carry Around? Motorhome storage and weight issues, what do we need to know? And why do we need to know it? RV Storage Tips: It Matters, What You Buy... And Where You Put It. RV Storage tips will help you understand some of your storage issues... before purchasing any new accessories. Our Class C Motorhome tires cost a lot of money and should we be thinking about tire safety when we replace them? RV Leveling... How To Make It Easy! Motorhome Repair and Maintenance: Is it better to wait until the season is over, or spread this chore out over time? Towing hitches allow a typical Class C Motorhome owner to really see the country.. let's see what is involved. 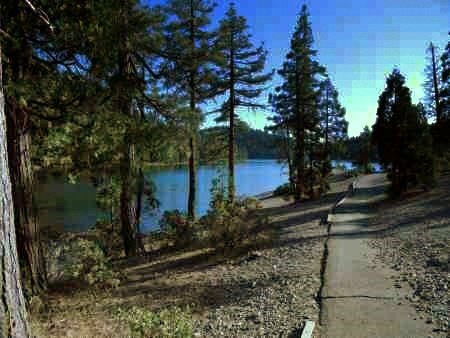 California Beach Camping: So "Where Is Your Favorite Campground?" Performing an overpressure leak test can save you from unwanted water damage! An LED Light Manufacturer has elevated the Light Emitting Diode’s performance output to a new level with the introduction of the new G4 LED lamp. How will you know when your rubber roof needs attention? You don't want to wait until it starts to leak! Zion National Park Camping... what time of the year is the water temperature perfect with the pines offering cool shade? 1995 Tioga Montara Had a Leak - Ouch! A Simple Way To Put An Elecrtrical Thermostat On A Small Space Heater In A Truck Camper! 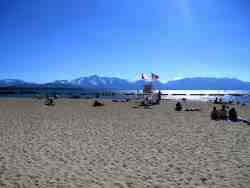 Lake Tahoe And A White Beach... The Water Can Be Cold, But The Summer Sun Feels Good!